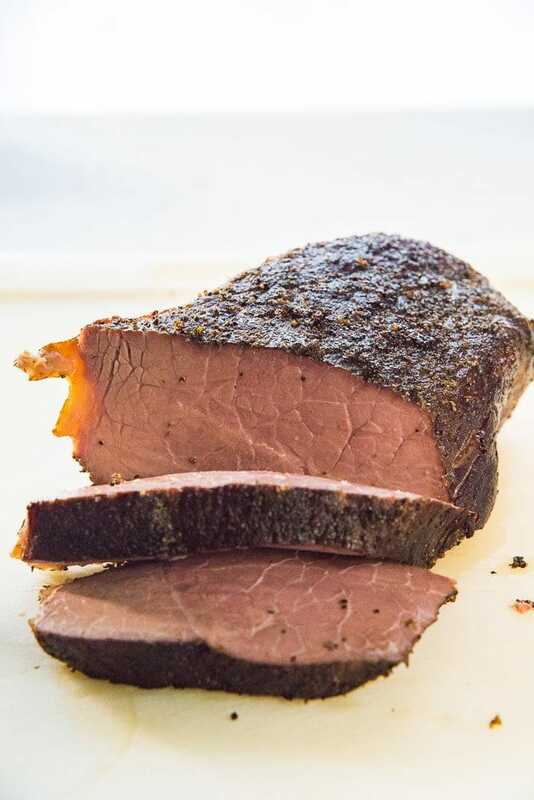 Sous-vide is the only way to transform a tough cut like bottom round roast or chuck roast or rump roast into a tender, succulent, juicy roast, while still cooking it at rare or medium rare! 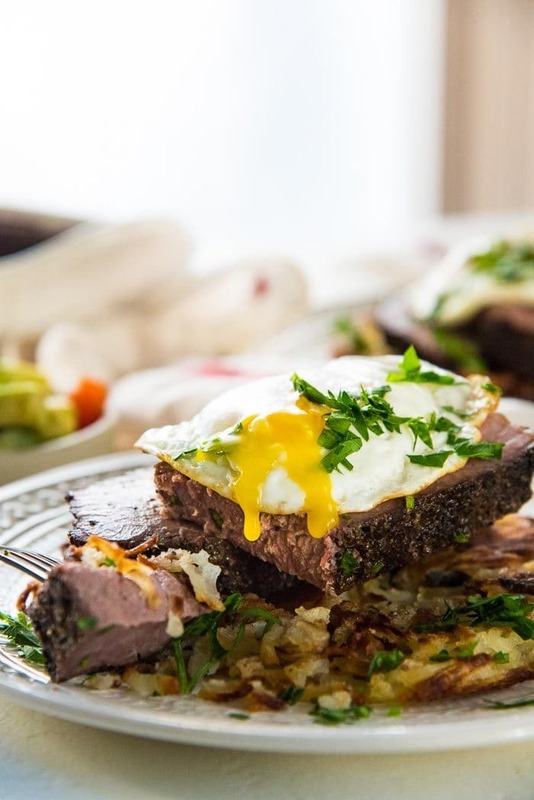 This sous-vide rump roast (or chuck roast) is perfect for dinner, for lunch sandwiches, and even for steak and eggs breakfast for a crowd! I’ll be sharing a special tutorial with you guys today – here I’m going to show you how to make an INCREDIBLE roast, with cheaper beef cuts like a chuck roast, bottom round roast or a rump roast! 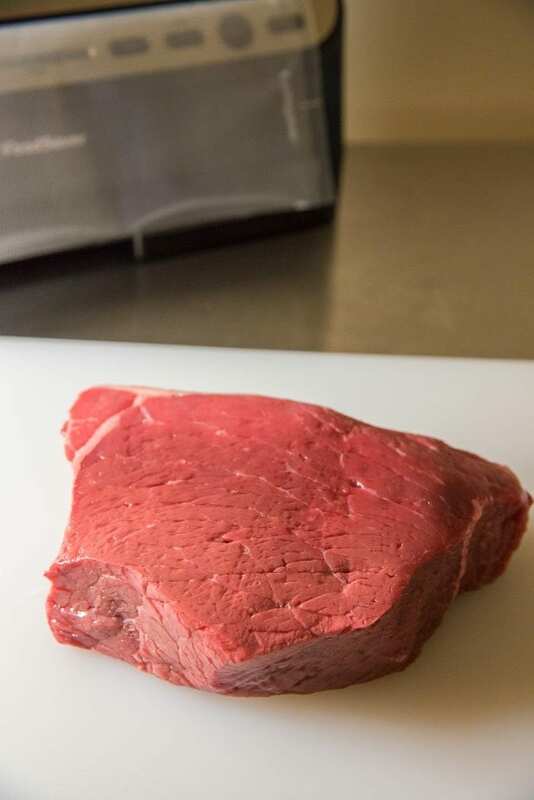 Specifically, this post is a step by step tutorial on how to sous-vide rump roast (or bottom round roast) or chuck roast, for deliciously tender results every time! Sous-vide is a simple yet intuitively clever method of cooking. I jumped on the sous-vide bandwagon a long time ago, and got hooked right from the start! I never cook my steak any other way now. 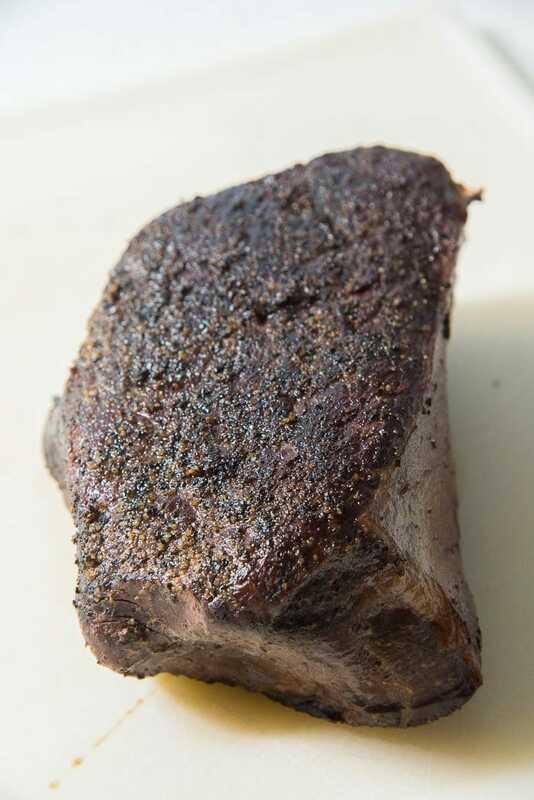 It gives perfectly succulent, tender, tasty steak every time, without hassle. As a sous-vide enthusiast, there’s another kitchen appliance that I cannot do without – a vacuum sealer! I’ve used a number of vacuum sealers before because it’s a great way to save money, eliminate waste and make sure my food lasts longer. And I can happily say that of all the vacuum sealers that I’ve used before, FoodSaver® V4440 2-in-1 Automatic Vacuum Sealing System is hands down my #1! So I’m not surprised that it’s even the #1 vacuum sealing system in the US as well! 🙂 You can get your hands on one of these incredible sealers by clicking on the image above! The FoodSaver® V4440 comes with a FoodSaver® 3PK 11″ Vacuum Seal Roll, PLUS pre cut vacuum bags AND resealable zipper bags. The FoodSaver® vacuum seal rolls and bags are safe for microwave, freezer, and refrigerator use. So you can pop them straight from the freezer or fridge into your sous-vide! 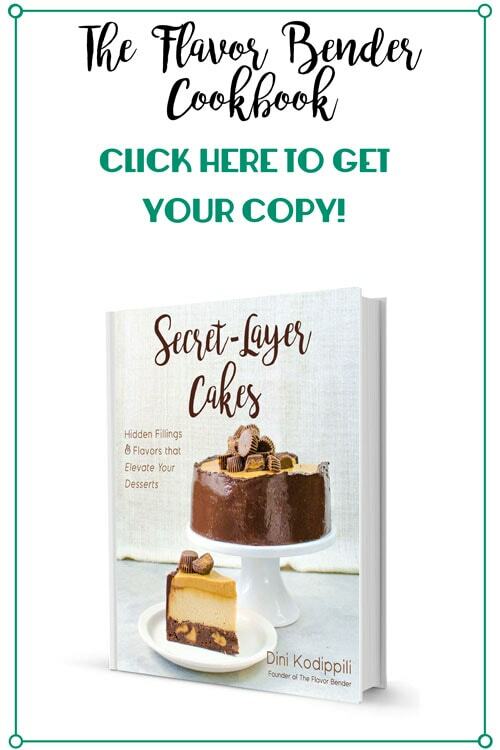 With FoodSaver® V4440, I’m able to use the traditional method of vacuum sealing my food, plus I have options for dry and moist vacuum sealing too. The wand vacuum sealer however, is a game changer for me! I can easily vacuum pack cheese or lunch meats in FoodSaver® zipper bags and reseal the bags after every time I open them. The FoodSaver® V4440 system is the perfect complement for a sous-vide. To sous-vide chuck roast or bottom round roast or any meat, I use the traditional method of vacuum sealing. It not only allows for an air-tight seal, but since ALL the air is sucked out, there’s even contact between the water and the meat. Plus the FoodSaver® vacuum seal rolls are heat-resistant and boast of multi-layer construction, so that the powerful heat-seal provides excellent durability to resist punctures and tears during cooking. It’s simple – the even, slow cooking ensures that your cut of beef NEVER overcooks! The longer you cook the beef, the more tender the meat becomes, without ever overcooking. This also means that the beef is never dry. Making beef roasts in the oven or instant pot certainly yields quicker results, but there’s a high chance that you may end up with unevenly or overcooked meat, resulting in stringy, dry roasts. You can sous-vide rump roast or chuck roast at medium, medium rare or rare with the help of a sous-vide. The vacuum packing allows the cut of meat to marinate at the same time that it cooks as well! 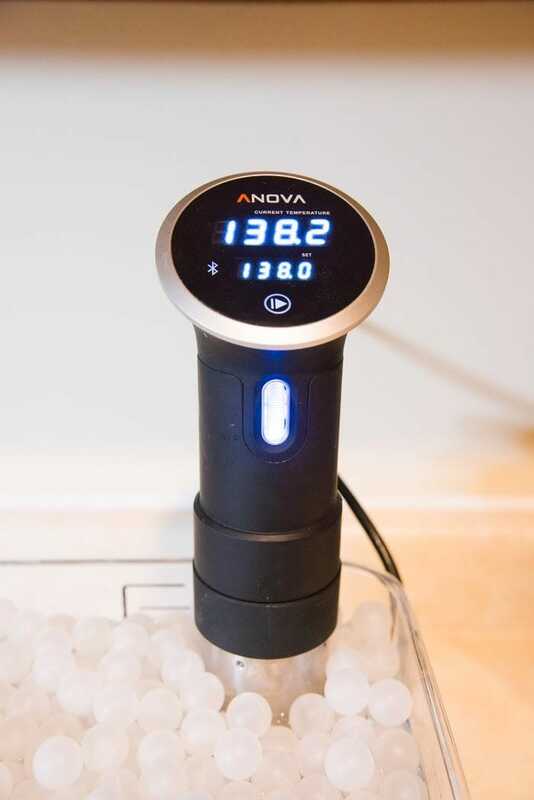 The sous-vide temperature should be 130 – 134°F (55 – 57°C). The minimum cook time to sous-vide bottom round roast or rump roast is 24 – 48 hours. I would recommend 24 hours, to get an even more tender roast. The sous-vide temperature is 138 – 145°F (59 – 63°C). 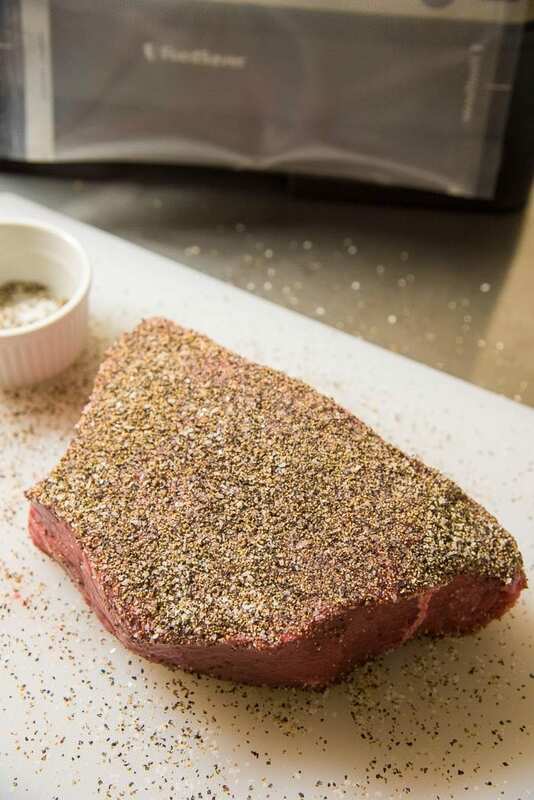 The minimum cook time to sous-vide bottom round roast or rump roast is 12 – 36 hours. I would recommend going up to 20 hours, to get an even more tender roast. The sous-vide temperature is 130 – 134°F (55 – 57°C). The minimum cook time to sous-vide chuck roast is 18- 48 hours. I would recommend 24 hours, to get an even more tender roast. The sous-vide temperature is 138 – 142°F (59 – 61°C). The minimum cook time to sous-vide chuck roast is 18 – 36 hours. I would recommend going up to 20 hours, to get an even more tender roast. The sous-vide temperature should be 155 – 158 °F (68 – 70 °C). The minimum cook time is 12 – 18 hours. The roast will be done faster, as it’s a higher cooking temperature. How can I add flavor to sous-vide rump roast (or bottom round roast) or chuck roast? My favorite way to add flavor to this roast is to create a spice crust! You can use your favorite spices or herbs for this, and you can be creative with it too. A salt and pepper crust is the simplest way to introduce flavor to the roast, and that’s what I did here. Once you’ve sealed the beef cut in a vacuum pack bag, make sure the beef is completely submerged in the preheated sous-vide tub. When it’s ready, you’ll find that the beef roast is perfectly cooked with a lot of juices in the bag. Just snip the corner of the bag and drain jus to a separate bowl or jug. This jus is PERFECT to pour over your slices of roast, or to make a gravy! I like to cook my rump roast or chuck roast to a nice pink medium, but sometimes I would even cook it at medium rare (higher temperature than rare, but lower than medium). The roast is then seared in a hot cast-iron pan for 45 secs to 1 minute on each side to get a nice caramelized crust. Allow the roast to rest, and then cut into slices to serve. The roast is incredibly tender, moist and packed with flavor! 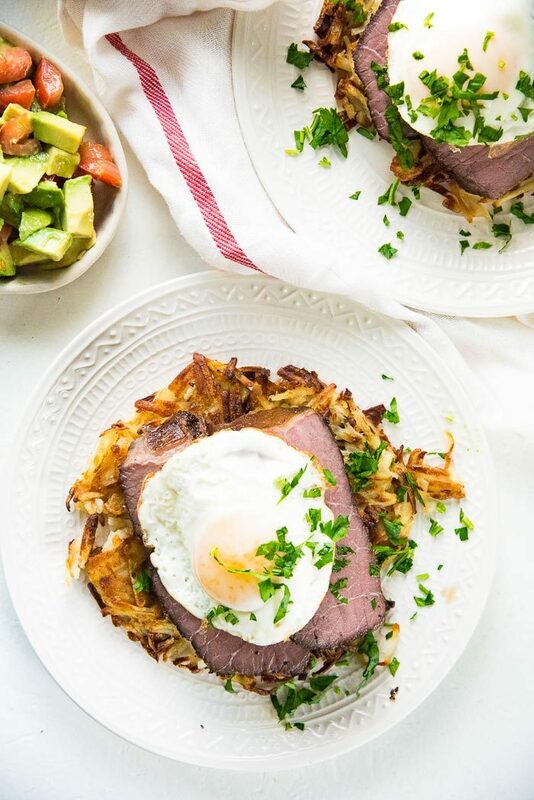 While it’s perfect for dinner with some roast vegetables, or sliced thinly for sandwiches for lunch, I LOVE this for breakfast or brunch – steak and eggs with potatoes, anyone? It’s perfect for a crowd, since you can cook a large roast at once! No one will ever never know that you transformed a tough cut of beef like bottom round roast or chuck roast into this succulent, juicy, tasty roast! 🙂 Sous-vide is the only way you can do that, while still cooking your roast at rare or medium rare. 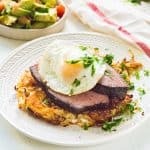 You can top it with fried eggs, or poached eggs and serve it with hash browns or breakfast potatoes. 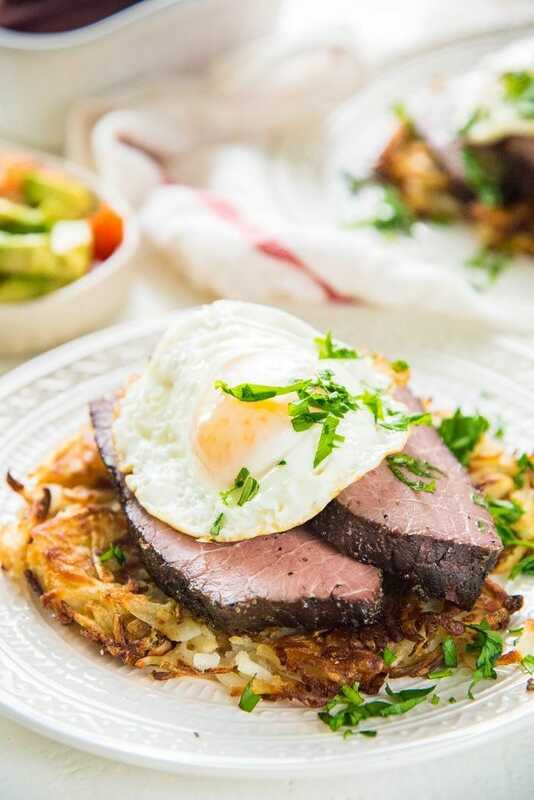 You can also serve this steak with a side of these oven roasted potatoes and eggs that you can make in the oven (get the recipe here!). Have you tried sous-vide before? It’s a game changer! Get your hands on a FoodSaver® V4440 2-in-1 Automatic Vacuum Sealing System on Amazon by clicking here, AND a pack of FoodSaver® 3PK 11″ Vacuum Seal Rolls on Amazon by clicking here. You can get 20% off from both items from 6/4 till 6/9! 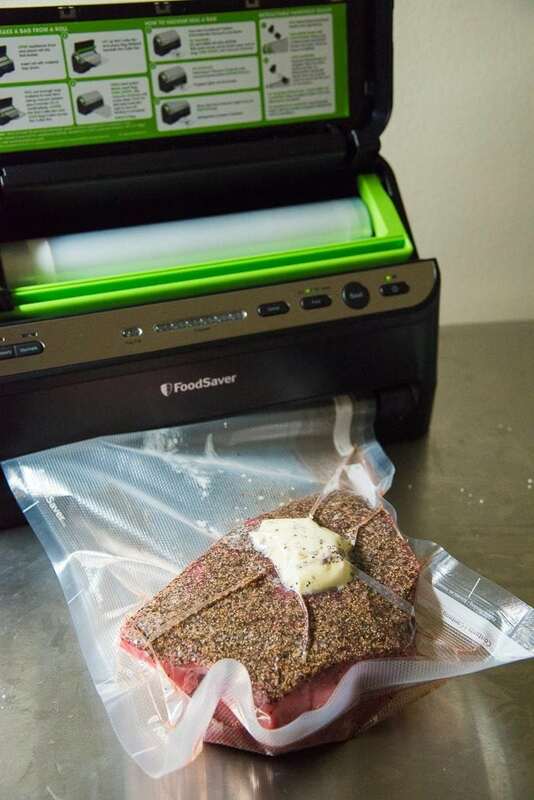 Not only are they great for sous-vide, but you can prevent food wasting at home when you vacuum seal your food. 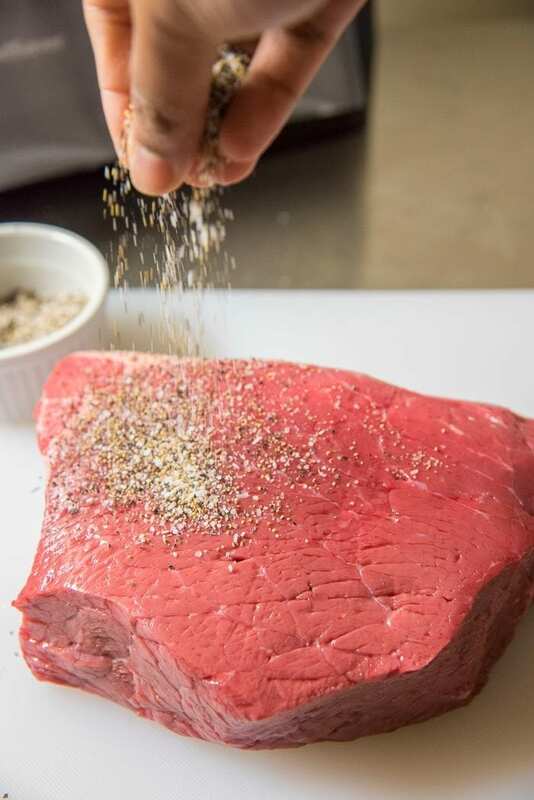 If you liked this recipe tutorial on how to sous-vide rump roast or chuck roast, don’t forget to subscribe for new (and free) recipes by entering your email address on the side bar (and get all these recipes delivered straight to your inbox), so you don’t miss out on a thing. 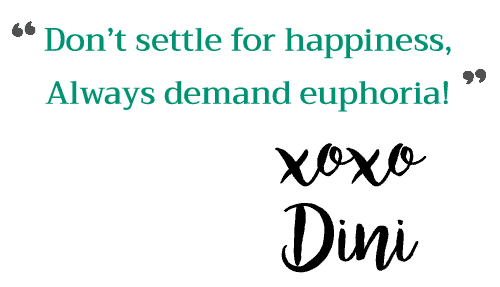 You can find me on FACEBOOK, TWITTER,INSTAGRAM, PINTEREST, YOU TUBE and GOOGLE-PLUS too. Pat dry the roast cut with a paper towel. Mix the salt, pepper and sugar together in a bowl. Sprinkle the spices over the roast, and press it into the meat to form a crust. Cut a bag from the FoodSaver® Vacuum Seal Roll - large enough to hold the roast. Seal one edge of the bag and place the beef roast in the bag. Add the butter over of the roast and vacuum seal the bag. 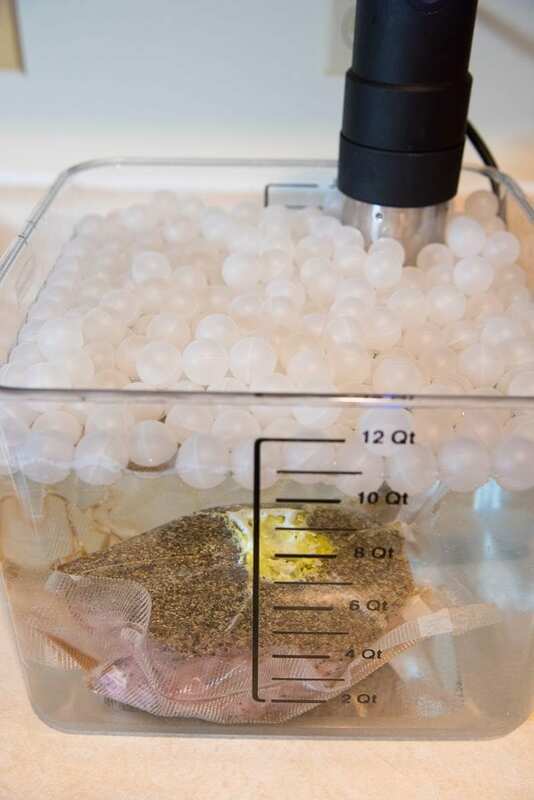 Fill a 12 qt container with water, and attach the sous-vide circulator. Set the temperature to the the right value, depending on whether you want a rare or medium roast. I set mine to 138°F for a medium rump roast. Cover the sous-vide with water to prevent evaporation. When the water reaches the right temperature, submerge the vacuum packed rump roast (or chuck roast) in the water. Note the time, and allow the rump roast to cook for at least 18 hours (but can be kept upto 36 hours). When the roast is done cooking, remove the bag from the water and allow the roast to rest for a few minutes. Snip the edge of the bag and pour the jus into a bowl. Heat a cast-iron pan over medium-high heat. Pour a little oil to coat the bottom of the pan. Sear the roast in the hot pan - 45 sec to 1 minute per side, until the surface is caramelized. Slice the sous-vide rump roast into thick or thin slices and serve with the jus. 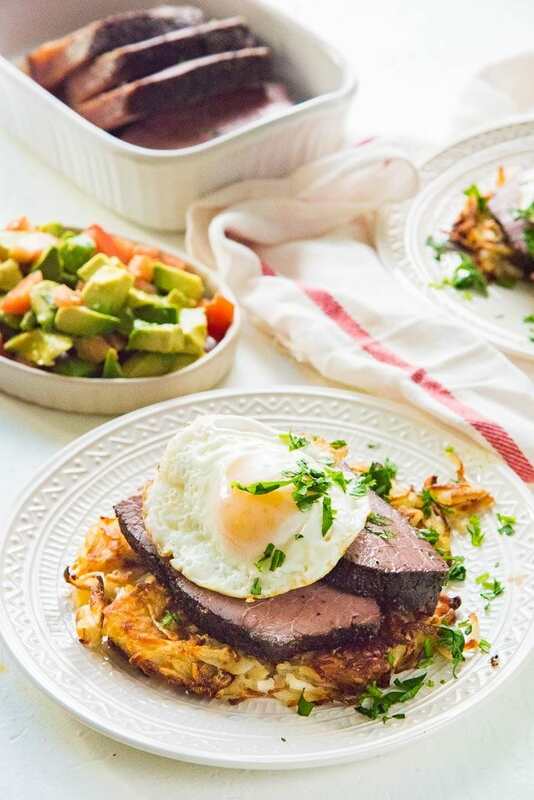 Serve with hash browns, or breakfast potatoes with eggs, for breakfast or brunch. Serving ideas - thinly slice the sous-vide rump roast for sandwiches, or for roast dinner with roasted vegetables. Note on cook times - cook times were derived from several sources and articles on food safety and sous-vide cooking. Your recipe is for 2.5lb roast. What family does that feed? I have never cooked a roast smaller than 4lbs. How do i adjust this recipe for larger cuts of meat? This 2.5lbs roast feeds my family. That being said, this recipe should in theory work fine for 4lbs as well, but personally, I would recommend 24 hours at 138°F. Hope that helps! Thank you, i will give it a try. This is all new to me. I have only cooked one thing so far, one steak. It was delish. Great sous vide recipe. I cannot get/ find the subscribe box on my phone. I tried to just click on the “subscribe” below the comment section but it disallowed that unless I entered a comment, so here you go. Merry Christmas Eve and a great Sous Vide to one and all. I did a bottom round roast for 32ish hours at 56C. This is a cut of meat I have a hard time with and the last one I made turned to leather in our crock pot. I had a spare roast of identical cut and weight to spare so I thought I’d try this. I used a crock pot on low hooked up to a PID controller and a SSR relay to achieve sous vide. It was amazing. I’ve never had a roast like this. It made it taste so buttery, so amazing. Will be doing again. And again. What temp does it need to be cooked for falling apart roast like a slow cooker? Thanks for sharing awesome roast with beef recipe. Looks very delicious. I’ll try it out soon once i get the lid for container or ping pong balls. Which one works better to retain heat or prevent water evaporate? Tin foil isn’t a good option because the water from the sous vide will get inside the foil and ruin the cut of meat. However, if you don’t have a vacuum machine, you can use the immersion method to seal the beef in a large ziploc bag. To do this, place the piece of meat in a ziploc bag, but don’t close the bag. Then slowly lower the bagged food into the sous vide water container, letting the pressure of the water press the air out through the top of the bag. 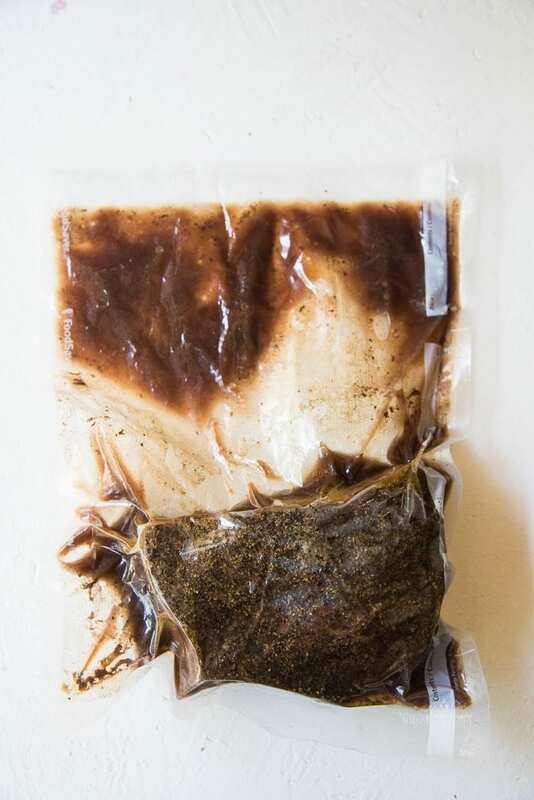 When the meat is completely immersed in water and most of the air has been pushed out, tightly seal the zip lock bag, making sure no water has entered the bag. Then you can proceed with recipe.